hey jo, again NO eyecandy this time 0_0..oh no, how could that be? well, we had some serious modeling going on...it was a cave entrance, that was very time consuming but also fun to model. and then we had several hours of exploring speedtree..
nervertheless we also did some highly interesting stuff! 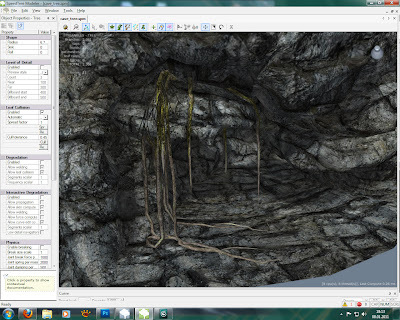 we imported our cave entrance into speedtree and then used it as a force to deform a speedtree that were actually liana! what should i say, it worked like a charm. i hope you students got some nice insights and the lecture was a success for u! ah in the end we imported all the stuff into the UDK, but we only had one hour to do so and therefore it was done in a hurry and with no nice lighting effects. we placed the cave entrance into a landscape and cut some terrain away. placed all materials on the terrain and walked this stuff..but that was nothing remarkable..